Eating two portions of mushrooms per week could halve your risk of abnormal brain decline in old age. Researchers found people who eat 300g or more of cooked mushrooms – about equal to a medium-sized punnet – have a reduced risk of mild cognitive impairment. And even eating smaller amounts could still be beneficial, they said. MCI is between natural brain decline and dementia, and people with the condition may experience forgetfulness and reduced language and attention skills. Mushrooms contain an amino acid which the body can’t make for itself and which is found in particularly low levels in people with MCI, scientists said. Researchers at the National University of Singapore interviewed more than 600 Chinese over-60s over the course of six years about their diet and health. The participants also took part in tests to work out how well their brains function and give them a ‘dementia rating’ to asses how much their minds had been damaged by age. Those who ate more than two portions of cooked mushrooms each week were up to 50 per cent less likely to have mild cognitive impairment. Although 300g of mushrooms may sound like a lot, the researchers believe even one small portion could still be beneficial for reducing the risk of MCI. ‘This correlation is surprising and encouraging,’ said one of the researchers, Feng Lei. Although people with MCI can usually still carry out day-to-day activities, their mental abilities are worse than would be expected for their age. Mild cognitive impairment (MCI) is a condition in which someone has minor problems with their thinking abilities. It is a set of symptoms rather than a specific disease. Symptoms may include forgetfulness, problems with planning or problem-solving, being easily distracted, taking longer than usual to recall words, or struggling with depth perception. MCI is between normal age-related decline and dementia – people with the condition have worse mental condition than would be expected for their age, but it isn’t disablingly bad. It is estimated between five and 20 per cent of over-65s in the UK have MCI. It isn’t a form of dementia but people with the condition are more likely to develop dementia as they get older. It isn’t a type of dementia but people with MCI – about five to 20 per cent of over- 65s in the UK – are more likely to develop dementia. ‘We’re very interested in a compound called ergothioneine (ET),’ said Dr Irwin Cheah. ‘ET is a unique antioxidant and anti-inflammatory which humans are unable to synthesise on their own. 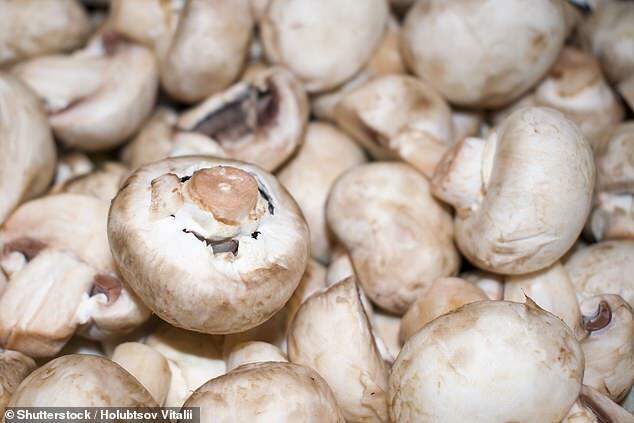 The mushrooms mentioned in the research were white button mushrooms and the oyster, shiitake and golden varietes, as well as dried and canned mushrooms. And the scientists added the positive effects were likely produced by many other types of the fungi. The team’s research is backed up by their previous research, which found levels of ET were much lower in people with MCI. Other substances which stimulate nerve growth and are found in mushrooms may also be beneficial – the team named substances called hericenones, erinacines, scabronines and dictyophorines. Mr Feng and his team hope, in future, to do more detailed research which could uncover whether there’s a causative link to rule out coincidence. The research was published in the Journal of Alzheimer’s Disease.